Designed for easy concealment when you need it, our Backup features a textured frame and bead-blasted anti-glare barrel designed to be powerful .45 ACP rounds with its 2.5- inch barrel. 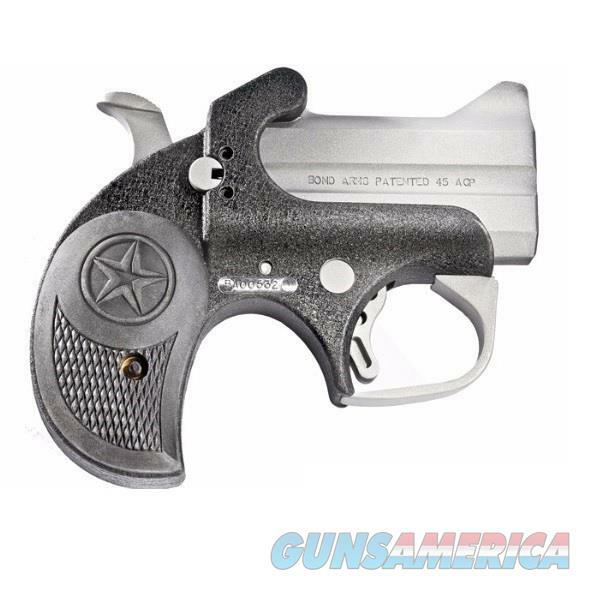 The Bond Arms Backup Derringer is a special-edition gun that's easy to conceal and carry, yet this compact powerhouse packs the same punch that Bond Arms guns are known for. Similar to the Remington Double Derringer of the 1860s. Equipped with a rebounding hammer and a spring-loaded cammed locking lever for a tight barrel fit and rapid reloading. Retracting firing pins and crossbolt safety. Stainless steel with matte finish and a black crinkle-powder coat.